Sooooo - I packed me bag and drove the chariot off to Slaggyford and parked it in a puddle of mud. And walked up to the top of Grey Nag. 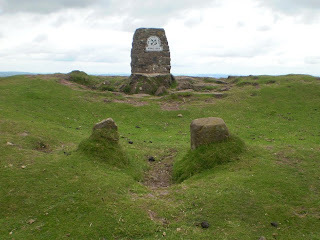 The top of Grey Nag is 2152 feet above sea level and has an old cairn with a trig point on top of it and what appears to be a substantial sheepfold, into which I insinuated the akto so as to be out of the frisky hurricane coming off the Solway Firth. The distance is exactly a few miles, but in a straight line and, in dayloght at least you can see chez Brian from the edge of Grey Nag. (I believe the older name for this hill may well be "Watch Hill Currick" by the way. Its a good place for an observation post for the watching for the approach of baddies towards Alston Moor from various directions) I have to report that the results were disappointing. 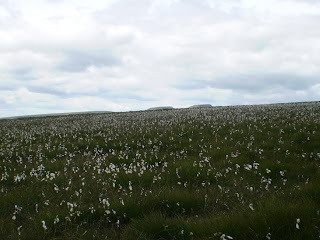 And it was perishing cold to be stood around on a Pennine scarp in that nithering wind. 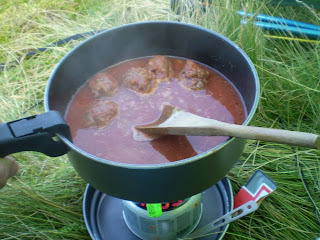 Anyway, I diverge from my purpose which is, of course, to describe the delights of Look-what-we-found basil meatballs in tomato sauce, whikst listenign to radio Scotland (good reception up here) and sipping a rather rough scotch. I got some criteria from various posters on http://www.walkingforum.co.uk/ and I describe my evening meal with reference to those. Credits at the bottom of the post. Portion size: Nowhere near big enough on its own. I added a small tin of peas and 80gm of smash. This didn't quite ruin it, but came close. It still tasted good, but looked a bit messy. Need to wash up after: Yes. get a dog. Overall: This is high quality, tasy food and very good vfm. 320 gms is not specially heavy, but you have to add things to it to make a meal. This wouldn't matter too much on short trips, or on the first day of a longer trip. The quality and taste make it worth the slight extra effort. Somebody should encourage the company to add some carbs to their basic meals and call them "hillwalkers" portions. Or something. These probably aren't their real names, I would suggest. 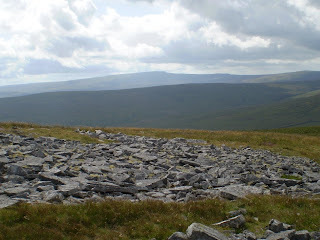 I'm just about to set off for a minor sojourn up a Pennine, the main purpose of which is to have about 36 hours reading a book and dreaming about Kylie Minogue. 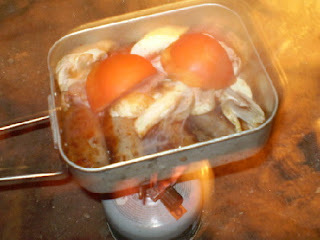 Breakfats is 3 mushrooms, 1 tomato, 3 pork sausages, 2 rashers of smoky bacon. I haven't picked out a book, yet. 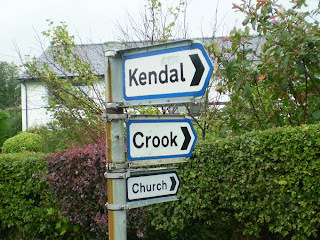 I may go down to Crook library. I notice the met office have poo-pooed the idea of a hot summer (only four or five weeks to go anyway...) and are predicting wetness. This is good. Break out the factor 35. Probably too late for the next couple of days, though. But I don't mind. I'll be in me tent. 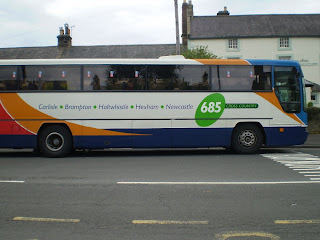 Anyway, I drove to Corbridge and abandoned the venerable knipemobile in the free car park by the river and caught the 685 bus to Heddon on the Wall (which is where I finished day 1). The 685 bus is proving to be very useful. I wish I was old enough for a bus pass…. There were a few other small groups of HW walkers around to make things interesting for, I have to say, this part isn’t the most interesting walking in the world. And it’s noisy too. All day I walked parallel to the B6318, known as “The Military Road”!. There’s a song about it. 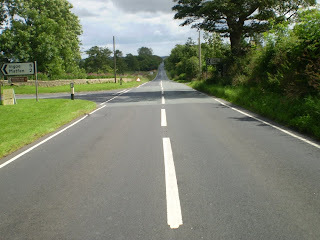 Its very straight and, you’d be forgiven for thinking that it was a Roman road. But it isn’t. 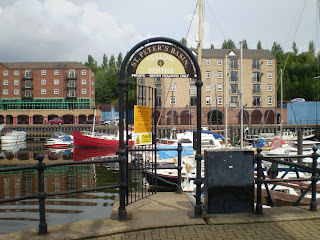 It was built when relations with the naughty Scots just to the North were still potentially a bit shaky and a road from Newcastle (with it’s short sea-borne supply lines to the South) to Carlisle would enable the movement of troops quickly across country to bugger up the plans of any tartan horde moving down the West coast route or investing Carlisle. They built it on top of most of the archaeology. They just didn’t care in those days. So, in showers light and heavy, I plodded West along a shorn strip of grass. I met a chap on a mowing machine and joked with him by asking how long it takes him to get to Carlisle. “Three weeks” says he. “Then we turn round and come back. 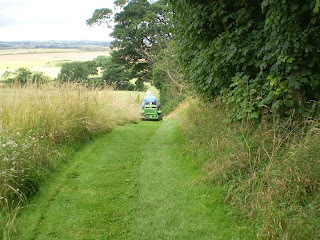 Its very enjoyable” His job was to mow a wide strip of grass for the HW walkers. And sure enough, there’s a wide strip of mown grass all the way. Except a few muddy bits. 3) The third was born in the hospital I used to work at in Bishop Auckland. It’s a very small world, specially up here in the North east. Luckily, Hadrians Wall is a popular route, so you can always have a chat. Excitement is also added to the walk at the Western end of the section by the frisky suckler cattle. There's a lot of beef around here. After the pub, I lunched under a gooseberry tree, fed the babies and picked two dozen ripe and juicy gooseberries, which I scoffed over the next few miles. I also happened upon the “Ramblers Rest” tea van which has a little garden and chairs and a pet blackbird – and a friendly chat over a cuppa and some ginger cake. Easy walking and just a few contours. I covered another 11 miles of Hadrians Wall, and 16 miles altogether, with 950 ish feet of uphill. One pint, one cuppa, 26 gooseberries. I decided at a fairly last minute to join this walk, which was aprt of Durham County Council's extensive guided walks programme and lead by a chap called Bill Gallon (pictured) Bill is Chairman of the Pennine Way Association and a strong promoter of the enjoyment the natural things that surround us. 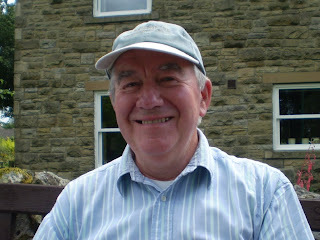 Bill now has a website at http://www.billswalks.co.uk/ This site was a birthday present to him from his son and, is, I must say, a cracking read. I quote from it's introductory passages "This website was created for his 69th birthday by his two sons and his new grandson, Will, who is looking forward to his Grandad taking him on these walks" and "Bill Gallon has lived his whole life in Gateshead and is a passionate advocate for the wildlife and enviroment around his home town and the North East of England"
Its not entirely finished yet, but have a look. The messages to grandad to do some more work here and there just add to the site's charm, I think. It will be a great resource for anybody about to embark on any County Durham/North pennine and general North of England walking. 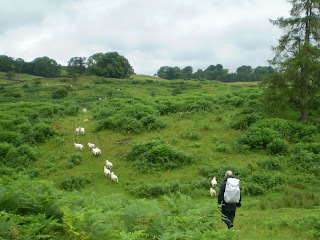 On to the walk - There were forty of us altogether - many of whom I knew and some I didn't. 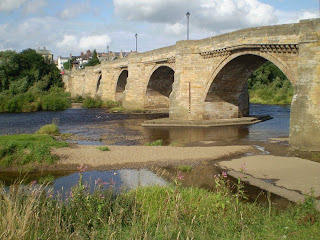 The aim was to follow the Teesdale Way East from Middleton in Teesdale - that's downstream - as far as Cotherstone and then walk back on the North (Yorkshire) side of the Tees back to Middleton. 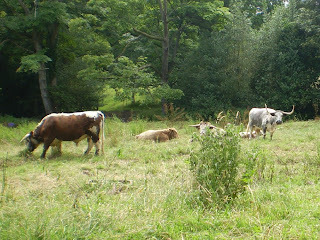 We walked along the riverside and then through pastures to Eggleston, more pastures to the outer suburbs of Cotherstone (! ), back through Romaldkirk and along a disused railway back to Middleton. 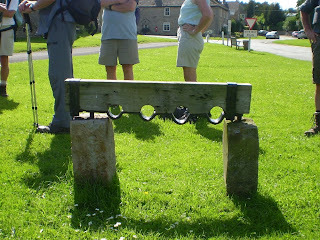 The three villages, Eggleston, Cotherstone and Romaldkirk are all medieval villages and have retained all kinds of ancient features, not least the fact that they generally have village greens (Romaldkirk has three) - two parallel streets and long enclosures or "tofts" - one for each property sticking out for hundreds of yards around an inner perimeter, then bigger "town" fields outside that - and then the moors. Romaldkirk has village stocks, two pubs and a plague pit and Eggleston has a pub, ancient pigstyes and some strip lychets, or cultivation terraces.... and so on. There's also the tale of "Gracie" who, in order to escape the plague, which devastated Romaldkirk to such an extent that there was nobody left to record the names of the dead, left the village with her cattle and built a new farm on the edge of the moor. Here, she survived the plague, but traded butter by remote control - leaving supplies on a stone to be collected, and money being left on the stone in payment. Eventually, the plague passed and she judged it safe to return to her cottage. Which burnt down and killed her. Gracie's farm is still there, however. A pleasant ramble on a warm summer day - 13 miles and, maybe, 600 feet of climbing. Walk today, for tommorrow it will rain. Have a look at Bill's website. Incidentally, there's a scarecrow competition going on in Teesdale just now. 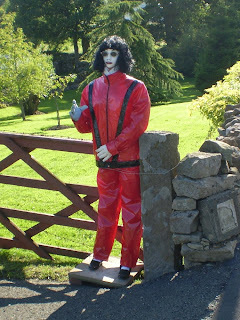 Pic shows Michael Jackson waiting for the milk lorry. Just having a liddle experiment with Youtube... I like this song. I wonder if a wild camp at Carterhaugh might be a bit too spooky, though... Carterhaugh is quite near Selkirk and, apart from angry witches, was quite close to a war crime just after the battle of Philliphaugh which involved the drowning of several dozens of women and children in the river, held down by lances....their men were marched off and shot at Newark castle nearby. You wouldn't want to be there at night.... on your own.... bad dreams.... (shiver) .... probably just a fox calling.....or an owl silently flitting ghostly beside the riverside.....or the wind in the trees... hush and listen (to the hairs on your neck standing up a line at a time) You wont sleep again till dawn. There is a lack of choice in breakfasts and sweets, but, apart from that there's enough choice on this website to eat a different meal each evening for a month. Which is enough. I need more breakfasts and sweets, though. Secondly - For this to be of any use at all to potential consumers of this scoff, I need some criteria by which to judge the food. 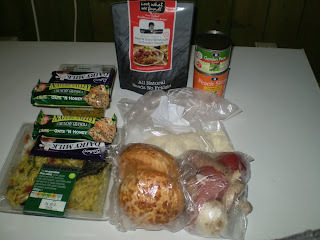 I will be looking at the ingredients, with special attention to the amount of salt (I don't really do salt) and saturated fats and calories claimed - bearing in mind that as hard-working backpackers, we want as many calories as possible. I do anyway. The suggestion box is open. The best suggestion will get a Real Turmat meal of your choice and the worst will get a bag of broken custard creams. Some may remember that a few days ago, I mentioned that I intended to walk from Millom to the Solway and I thought it might be useful or even interesting if I confided about the planning of the walk with readers. And I know how to get to the start - by train, and I've bought the tickets. I'll worry about getting home from wherever I end up. Its not a problem that can't easily be solved by chucking a small amount of cash and time at. 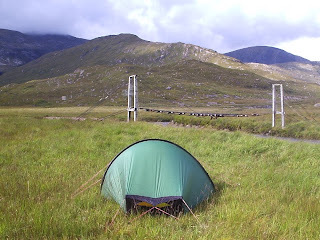 Shelter will be provided by my Hilleberg Akto which will be pitched wherever I want to put it. I'm not going to plan each night's camping spot,except to say that I ought to be moving around twelve mile each day, as an average. I'll be opportunistic about camping spots. And so, we come to food. I like to do a food plan. This doesnt say exactly what I might take for scoffies, but it does say how many meals I might carry and where I might buy even more food. Doing a food plan depends on having already designed the route, of course. 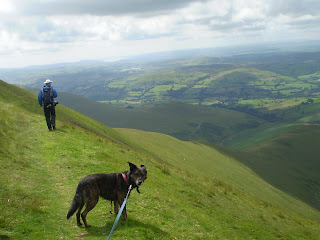 The first idea was to carry all the food that I'd need as far as Threlkeld and then stock up again. 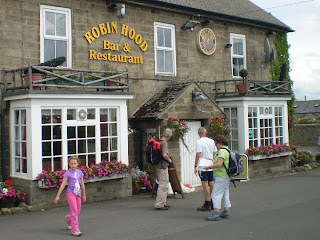 There's a pub at Caldbeck, so that evening should be sorted..... And then Martin Banfield suggested that I would have to carry a lot of food which would be very heavy and why didn't I visit a bit of "civilisation" so that I could eat something substantial and drink beer and stuff. And carry a bit less.... Hmmmm... yes...., course, I knew that, innit... so I've altered the route ever-so-slightly to include a visit to the fleshpots of Grasmere. 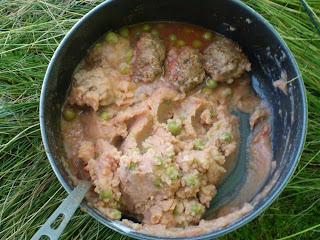 The rest of the food, I'll get from http://www.outdoorsgrub.co.uk/ who "do" backpacking scran. There's three or four different companies in their catalogue and it might be interesting to get at least one product from each and make some kind of unscientific comparisons, and report back on the blog. I'll be selecting a range of breakfasts and dinners later today. Its time to do this kind of stuff now. 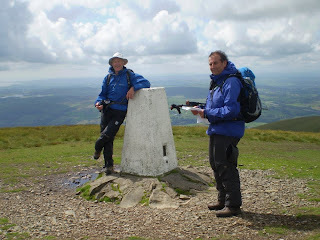 Anybody who's read any of the Howgills diary stuff on Doodlecat may well appreciate my reasons for saying that if a body has a hankering to wander over Dartmoor dressed as Chairman Mao, or bag 100 Munros, or climb a tree or whatever it is, then just get on and do it. Otherwise, the opportunities to fulfil your ambitions may well just float away from your grasp, either quietly and unnoticed, or suddenly and catastrophically. I thought this had happened to me a couple of years ago, and the prospect of a life on a sofa instead of having me hair ruffled up a hill every now and then was absolutely devastating. As it happened, the local NHS did a fab job in quick time and I struggled back (I still struggle at times) This is important. Happiness has little to do with pleasure. Make the plans and tell your friends. Basically, it chucked it down all day and all of the pubs were tightly shut. I used an umbrella for most of the day. I noted, too, that most of the time, the umbrella actually had a negative weight. It's anti-gravitational properties encouraged by a cheeky breeze meant that at times I had to hold it down. 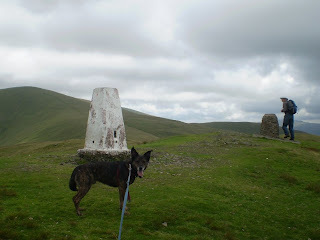 On the summit of Crook Knott, where the fabulous view wasn't , the upwards G force was several kilos, I expect. At one point, due to the lack of lounge bar facilities available, we camped out briefly in the porch of All Saints Church at Underbarrow. This is much better than St Michaels Chapel which I visited the other day, cos this is ALL the saints. This church goes up to eleven. 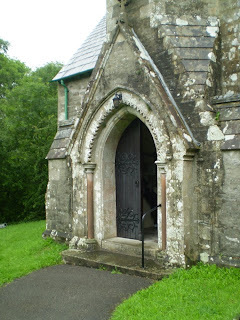 (probably more....) Anyway, we ate our butties in the porch and I donated some loose change into the offertory as compensation for the wet bum marks on the porch floor. And so, eventually, we arrived damply at Windermere where John's wife rang and asked if we wanted picking up. A no-brainer in the circumstances. She arrived fifteen minutes later and we wet the seats of her car and dampened her boot. The queue at the station ticket office had stalled with some chap enquiring about the station facilities in Cardiff or whether or not he could get vegetarian cappucino in the buffet in Leeds...or something. Whatever it was, it was taking a long time and people were starting to fret about whether or not they would get a ticket before the train came and went again. The chap inside the security glass cared not and showed patience, boredom and a mischievious lack of concern about the length of the growing, fidgeting whingeing, queue of potential customers. Didn't take superdawg on this mission as he wouldn't have enjoyed the constant rain (he hates that kind of thing) and the suckler cows would have mugged him. So he stayed home in front of the fire with a good book and a mug of hot, sweet coffee. Me and John did 13 miles and 1900 feet of uphill. 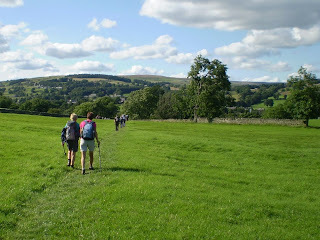 We followed the Dales Way for a bit. I'm not doing the Dales Way if the weather is like this all the time, though. 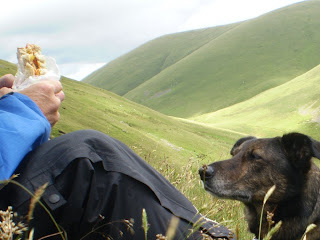 We met in a Sedbergh tea room and after having ..er…coffees – we collected Bruno, the team dog, slayer of spiders and bluebottles and digestive services assistant for the day (helps out with spare or dropped food)… Bruno was waiting patiently in the car. We followed a fairly conventional route to start with by bagging the very lovely but windy, Winder, then to Arant Haw and along the curvaceous ridge as far as Calders. 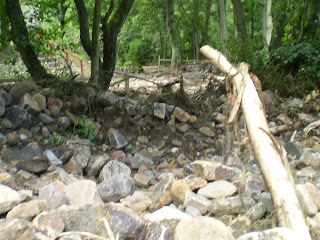 Most Howgill veterans will recognise the route so far. The usual thing to do from here is to go straight to the trig on top of The Calf. 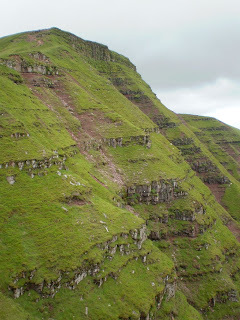 We went the way that people usually go….when they’re a bit lost and went over Great Dummacks to the Southern edge of Cautley Crag, which we followed Northwards, downhill to the top of the Cautley Spout and there, on a little grassy ledge, we did lunch. 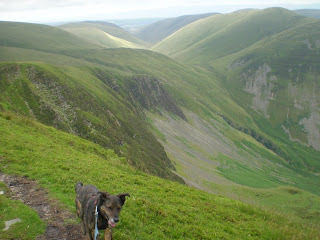 The big corrie below the waterfall and the crag are, for me, the best view in the Howgill fells. I just love that spot. I was also quite enamoured by my chicken salad butty and Bruno was his usual helpful self as far as Martin’s sandwich was concerned. Afterwards, we climbed a simple grassy shoulder to the trig on The Calf (we get there eventually) and we descended to the intake wall by the delightful grassy Bram Rigg. 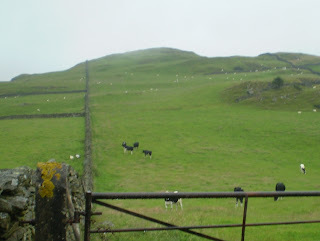 We followed the intake wall back to Sedbergh. A cracking walk in good company. The only clouds on the horizon were the clouds on the horizon which just occasionally started to shower on us, then thought better of it and stopped, and the fact that the Sedbergh tea rooms were packing up and going home to watch the Weakest Link just as we arrived, gagging for a cuppa. A short video showing a bit of a panorama and some miming is below. There’s no sound on my camera. This may be just as well………..
Back in the depths of Justafterchristmas when nights were cold and I still had a small supply of Dad's Christmas Whisky (now all used up, sadly...) I planned my 2009 events. This included a long walk to be taken in August. I'd no idea where at the time. Then, in a blinding flash of flashing blindness it suddenly occurred to me to walk across the length of Cumbria (by that, I mean up , as opposed to across) keeping as high as possible (in terms of altitude, I won't be taking drugs) and a brief examination of some maps indicated that just such a walk was technically possible. And so, I worked out a route from Millom to Bowfell to Dunmail raise to Helvellyn and Threlkeld and then over the top of the back O' Skiddaw to Caldbelck and thus by roads and lanes to Bowness on Solway. Then I remembered it and had a sinking feeling. Then I bought train tickets to Millom. Thirty-two of your Queen's Pounds. I start on the tenth of August. I have much planning to do, though. And as I have this bloggy thing here, I might as well record the planning. I'm now thinking about food. In the meantime, over the next two days, I have two walks planned. After that I'll do the food thing. 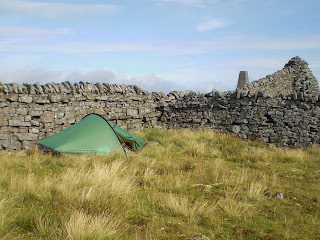 A chap who calls himself "Peakbagger" on http://www.walkingforum.co.uk/ pointed out this site yesterday http://www.raintoday.co.uk/Which I think is rather good. So I put a link to it over in the "some websites" rectangle on this very blog. It was so wet, I went swimming, albeit in the local public pool. And so, after nursing a pint of Scruttocks Old Dirigible for a while, subsequent to which it seemed to have evaporated or something, I continued along the very attractive riverside path past the coal staithes where Carter (as in “Get Carter”) started to chase one of the villains around with a shotgun and a bottle of whisky till they got (in the space of a couple of minutes) about 20 miles down the Durham Coast where Carter done him in and dumped the corpse in a coal-hopper. I sat out in the sun, stroking the landlady’s poodle (ahem) and gazing across the river to ..er.. the other side of the river. This was where, in 1640, which is just was just before teatime in those days, the naughty Scots under the highly experienced General Leslie and his 20,000 enthusiastic soldiers and 100 pieces of artillery, faced a few thousand reluctant, under-equipped, safety-concious, untrained and generally pissed off English defenders and battered them till they ran away. 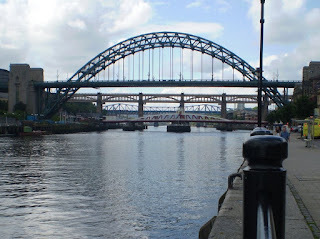 Thus, the Scots outflanked the Northern defences of Newcastle, approached it from the direction of the Metro centre (which was doing special offers in tattie scones and crates of Tennants lager that week) and persuaded it to surrender. The English parliament refused to pay for another army to eject the Scots from the North-East and quite a lot of trouble ensued, during which King Charles went on to lose his head. General Leslie invented the electric organ and retired to the Winter Gardens in Blackpool. I know a lot about history, me. And so, refreshed, I continued along the riverbank, which was now unmetalled and had, in fact, unknown to me, been diverted, and then along another old tramway as far as George Stephenson’s birthplace. 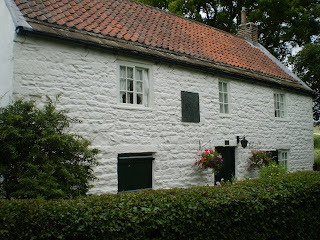 George Stephenson’s family lived in one room of the cottage and George, of course, went on to invent station announcements, the refreshment trolley service and signal failures. So the lad done well, even if the London bankers took the mickey out of his Northumbrian accent. He’d always had an ambition to visit the train museum in Darlington , so he built a railway to it. Unfortunatelty his train was delayed and it was closed when he arrived. As I say, I know a lot about history. Next there were contours. Aaargh. 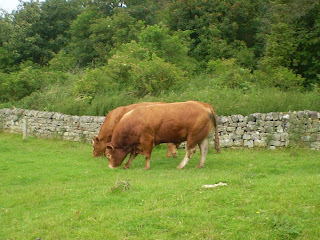 Eight or nine 10 metre contours are encountered on the walk up to Heddon on the Wall. Some of them are rather too friendly with each other which results in the hill being a bit of a slog at the end of a day and what with the legs being full of amber nectar as well. West to East walkers should be encouraged that once they get to Heddon, virtually all of any uphill work is behind them. 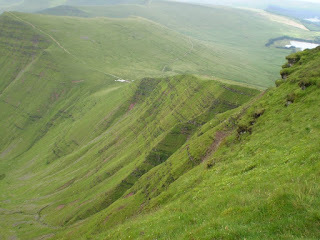 Its downhill or very flat from here and very very easy walking. 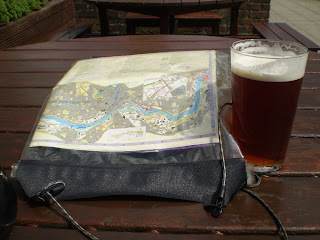 As I had missed the bus by approximately minus eight minutes, I went into the Three Tuns pub and bus stop and had a quick three or four pints of the local brew before the next bus came and hour and eight minutes later. The 685 took me swiftly and cheaply (£2.80) back into Newcastle for the train back to Durham. “Bing Bong. Pazzgers waity on paffoam four for the ninetin farty chain to Bergam Noo Steee shudd be away that the chain iz now leavin fom paffoam six. Fangoo." The next Hadrian's Wall day, From Heddon towards Corbridge (notice the careful wording here) is due to happen on 27 July 2009. I can't wait, Day 1 was such good walking. 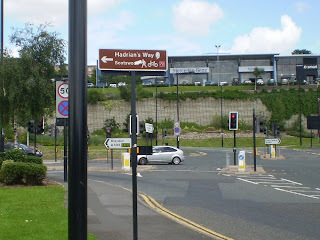 This is the start of my exposition of the Hadrian’s Wall path from Wallsend to Bowness on Solway. I’ll be doing this in day walks over the next couple of months. Its not a guide to the walk, but, maybe, readers planning to do this walk from East to West might get some idea of what its like. Readers intending to travel West to East will need to read it backwards. 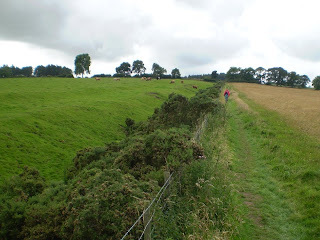 Day 1 – Wallsend to Heddon on the Wall 14 Miles and (a mere) 450 feet of uphill. Mainly riverside, Newcastle Quayside, Alang the Scotswood Road to Blaydon, more riverside, and a golf course. Pretty much all on tarmac or pavement. And flat. You don’t need hill boots for this. Take some cash to spend. I used public transport to get around. Apart from the walking bit. I walked the walking bit. I was lucky that I’d taken the median time from all of the clocks in the house and not just the mode. If I’d used the mode, I’d have missed the ten past eight bus from Crook which leaves at three minutes to seven. As it was, I was early. This didn’t matter too much as the train was late. Anyway, it turned up eventually and the Tyneside Metro took me efficiently to Wallsend (announced as “Warlzend”) in about a quarter of an hour. I progressed slightly self-conciously down to the start of Hadrian's Wall, the excavated and partially recreated roman outpost of Segedunum, with its visitor centre and general “stuff” It’s a big site. 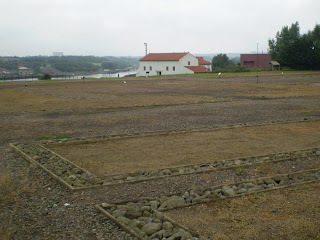 Apparently it was very a very popular posting for roman soldiers due to it being very near the shops and not too far from Whitley Bay, where they could take the kids to the sands at weekends. 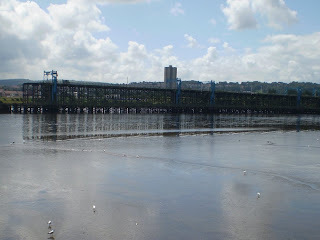 It’s a fine walk, though and starts well with a long, wild strip of feral woodland, thick with all kinds of wild flowers, the scents of which mix with the city smells of fresh coffee and new bread and the seaweedy River just over there. There’s also willow warblers and chiff-chaffs mixed with gulls and factory noisies and police cars and childrens playgrounds. They've even got a rich cover of almost ripe brambles and dozens of cherry trees full of cherries. And buddleia with butterflies. It’s a heady, exciting mix. I found it immensely enjoyable and I marched along easily and happily. There are no difficulties. 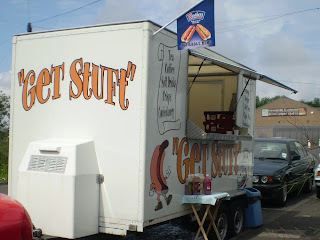 There’s even a tea van (“get Stuft”) which does a very nice sausage butty for a couple of quid. 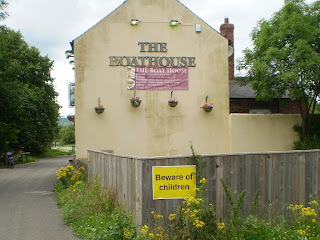 But there’s pubs and cafes as well. Ultimately, the path leaves the line and joins the riverside at Walker and follows this into the middle of the city where I decided to sit and take it all in for a while. 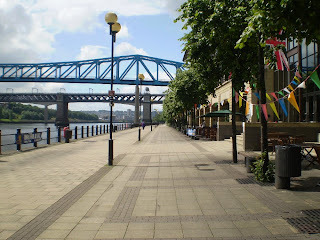 I sat in the sun at the Quayside pub amongst the lunching office workers. Whilst we're waiting for the first trip along Hadrian's Wall to start (see below), I just thought I'd fill in the gap with a few more pics of the "main" Brecon Beacons ridge. 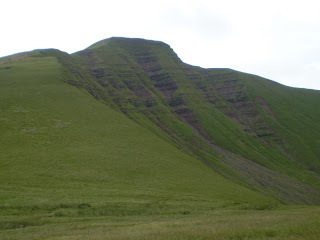 Inevitably, most of these involve the camera being pointed towards Pen y Fan which draws the eye magnetically, (not like an etch-a-sketch yer great daft wazzock*). I'm showing the pics coz I finks its nice. Really attentive readers may well note that one of the pictures is a tree and not a hill. 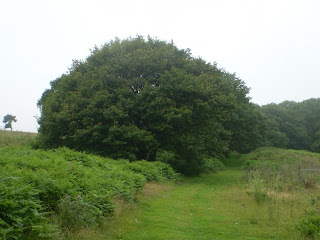 This is one of the very fine oak trees encountered on the approach to Sugar Loaf, an almost 2000 foot hill just next to Abergavenny. 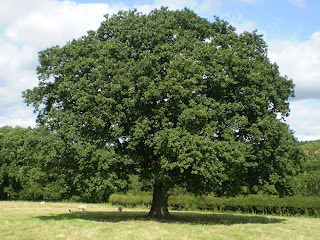 These trees are in the care of the National Trust and you just want to hug and kiss them and have their saplings. I fawn over their acorns. I stroke their gnarly roots and I rub myself against them in a rather embarrassing manner. Anyway, I hope you enjoy the pics. 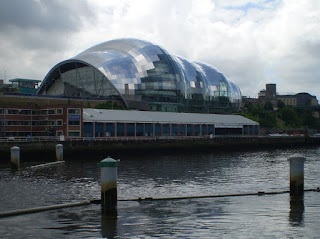 Notes: Hadrian's Wall - I start tommorrow at Wallsend and, hopefully, end at Heddon on the Wall where the 685 Stagecoach bus will take me back to Newcastle. I'm really looking forward to this. I might pick up a bit of latin, or maybe a Gregg's Cheese salad sandwhich. * Wazzock - A colloquial Yorkshire dialect word invented in a bus queue in Batley at 11:30 pm on a Saturday night in February 1967 when, due to an over-enthusiastic night of beer swilling, one chap dropped his wife's fish chips and peas in a mucky puddle and ruined both the supper and his chances of a bit of rumpy-pumpy on Sunday morning.Use as in "yer great wazzock" A "little wazzock" is a child who has just covered your new trousers in chocolate fingerprints or has had a toilet accident in the back of the car despite being told time and time again to have a wee before you set off..
Add this to your dictionaries. Next week, we'll be exploring the words "Spawny Wart" Maybe we could get all this translated into latin. 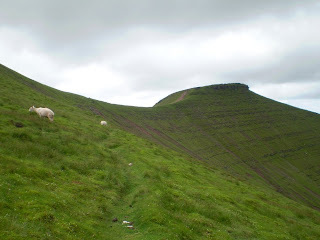 In order to prevent repetition, and for space to move on to new things next week, I’ll just make the one posting about the little trip to the Brecon Beacons. I must say, though, that in terms of the number of things ticked off the list and, generally, “things to be achieved”, this was quite a successful expedition. Then, after putting up the tent and festering for an evening, the time came to bag a Hewitt. 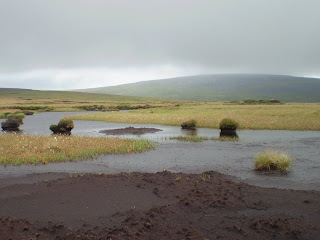 In view of the driech wetness and general clamminess all round, Carreg lwyd was chosen and this, in turn repaid the effort by being a bit dull. I bet it would be nice on a warm summers day in, say, early July. But not today. 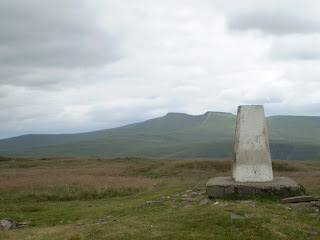 And then came Corn Du, Pen y Fan , Y Cribyn and Fan y Big. Anybody visiting these parts should be minded to visit evil and unpleasant things (ribbet, Rachel!) 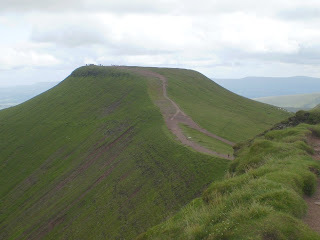 on any person even thinking about suggesting that these hills ought to be or even could be missed out of a visit to the Brecon Beacons. They really do just have to be done. They’re great. Fantastic. The highlight of the week. I’ve only included one pic, just for illustration. They’re very popular, so I expect that vast swathes of the readership( hah!) will have already been up these, so you won’t miss a few photos. I might use some later on when an irrelevant picture about something or other is called for. Fan Lia and Fan Fawr with a few other grassy things came next, and then Waun Fach and a little Dewey by the name of Brian or something, followed by a plunge through oakwoods due to a path disappearing when it shouldn’t have. Some people find this kind of thing a bit annoying. I quite enjoy the challenge. And a decisive approach gets things done, even if you turn out the other end just a bit scratched. There’s always a danger that you might get shouted at, though, by some irate farmer or the occupant of a bungalow who is just getting ready for his bath. Or something. Lastly, I had a day Marilyn bagging near Abergavenny. Sugar Loaf was done in mist and a bit of rain, but through superb and spectacularly beautiful oakwoods, with quite a few “veteran” trees. I followed this with the diminutive but green and also beautiful Bryn Arw, with mewing buzzards, a man scything bracken in the old-fashioned way (with a scythe!) and showers queuing up along the valley. Lastly was Ysgyryd Fawr (The skirrid), a steep lump which seems to be a volcanic plug, very similar to all of those Central Scottish plugs. Steep and wooded and brackeny with a bit of archaeology on the top in the form of “St Michaels Chapel” St Michael being the patron saint of ladies pants and had his chapel, apparently on the top of an older cairn. Two ladies were looking for this place and we had a nice chat. 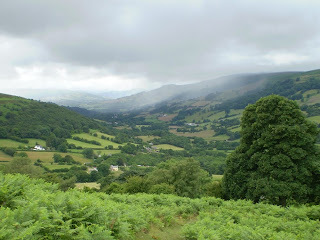 They remarked on the fact that the view was now from the Gower to Shropshire. I couldn’t confirm or deny this. I expect they were right. These little border hills are just the thing for a jaded hill bagger, though the thigh-muscle wrecking properties of the steep little buggers shouldn’t be underestimated. Fab stuff. I’ll be back.